Shuddh Sarang (ends with a Drut appendage in Raga Suha). i cant say in words about khan saheb ……..simply …..was a legend…..
USTAD AMIR KHAN SHAEB , REALLY REALLY A DIVINE VOICE WHICH UPLIFT THE LISTENERS ABOVE MATERIAL PLANE. I simply idolize this great human being. He was a bit more than a mere singer! Since my childhood I consider him my Ruhaani-Guru. ustad amir khan is very difficult to understand and follow.i find none except pandit srikant bakre totally digesting khansaheb.. Yes indeed. I learned from Bakre, directed by Khansahab. badi muddat se hota hai chaman mein deedawar paida…………. I am regular member of this precious musuic site. So, I take this opportunity to let you know that I have so many audio files of legend Ustad Amir Khan and Bare Gulam Ali Khan Saheb. Indeed, few songs are rare. These audio songs/files are downloaded from various sources. But I have not my own web siteto upload. Hence, kindly let me advise how can I upload these files here. Sahab, mujhe mil sakti hain ye files? I’m a shagird of Khansahab (his only foreign one) and I know Kankana. Many stories about him. dear sir, i have been listening to ustad amirkhan from my childhood. my father was an ametuer tabla player & a great fan of khansahib. 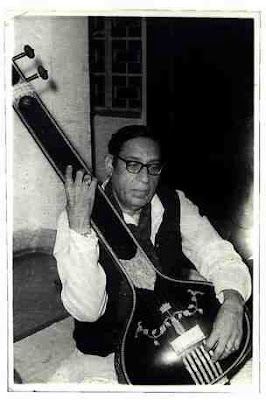 he had very personal contacts with him.i still remember the day ustadji died of the car accident,somewhere in south kolkata, my father was not well for days.my music inspiration emerged from his raag darbari kanada.kin bairon kaan bhare. I am very grateful to you for having made me and my students and friends listen to such great pillars of Hindustani Classical Music. May God bless you. It is well past midnight.The quietness and serenity of nature is gently carried on its melodious rendering of Aiman Kalyan by purity of Khansahibs voice. I have no words to describe this joy and peace-simply divine. The music of Ustad Amir Khan was a part of my growing up. My father was an amateur classical singer and we had this whole collection of vinyl records of the Ustad’s music. For years I was searching for a modern format of this legendary voice and then I discovered your site. I am really thankful that you have taken the pains to put it together. It really made my day. Thanks once again. Many thanks for posting raag Darbari by Ustad Amir Khan. It is definitely the Emperor of Ragas. I love Ustad Amir Khan’s Darbari, Hansadhwani, Marwa and many other renditions. Best time to listen to Khan Shaheb is after 11 pm. We used to listen to Khan Shaheb on Firday nights and used to say ‘Friday Night is Music Night’ after whole week’s work one can unwind himself/herself by listening to Khan Shaheb. This was between ’73 and ’87. I broadcast Hindustani classical music at its very best every Wednesday between 7 & 8 pm UK time via Surtarang [Wave of Melody] Broadcast worldwide. Kindly listen to us via http://www.surtarang.co.uk and http://www.wcrfm.com and let me have your valuable comments. This month we are celebrating the Birth Centenary of the legendary flautist late Pt Pannalal Ghosh and our repeat broadcast will be on Sunday 31st July between 10 & 11 pm UK time via our website http://www.surtarang.co.uk & http://www.wcrfm.com Please click on the top line from our website http://www.surtarang.co.uk and you will be connected to WCR FM’s site. Just click Listen Live & listen online. You could record it on a CD-RW or on your hard drive and listen to it later. I would be interested to get hold of rare recordings of Ustad Amir Khan, Ustad Bade Ghulam Ali Khan, Ustad Salamat Ali Khan, Ustad Ghulam Mustafa Khan, Pandit Jasraj just to name a few as we can broadcast them via Surtarang broadcast worldwide for others to enjoy as ‘Music is for sharing’, an internationally renowned musician told us before starting his recital in 1986. I still remember it! Please check our blog http://surtarangthewaveofraga.blogspot.com for all our playlists starting from 29 December 2010 which will give you details of our commitment and dedicattion to propagate Hindustani classical music in the West since March 1973. Many thanks for sharing his renditions with us, albeit I may have all those LPs. I look forward to hearing more immortal music. Is there a Surmalhar by Ustad Amirkhan Sahib? pl. somebody upload it here! Thank you very much for uploading so many valuable clips. Waiting for more uploads, I am sure it helped many people like me. Keep it up! Can anybody tell me the source of the Suddha Sarang? Even from Ustadji, I must say it is one of the most marvellous meditative vilambits I have ever heard. Just pure gold. Ustad Amir Khan Saheb is the greatest Khyal singer of all time. He has seen and explored lands, seas and planets of Music that no one is able to do. No words can render justice to his contribution to Music and Intellect.